You take their tests (training involved first) and if you earn enough points (1500 for XP) then you get a free copy. Just follow the directions on the Overclocking HQ article. Oh and another thing to mention. You have to watch every part of the Training chapters because it knows when you haven't and won't let you finish the final "All Courses Test" to get enough points to get XP. If you get stuck at the end and can't figure out what you may have missed in order to be able to take the "All Courses Test" just go to My Profile and then to Training and it will tell you what you haven't completed. This will take you around 20 minutes of your time. Sorry if someone has already posted this. What should I do if I change employment? Click on Help on the left navigation bar. Select Contact Us and send us information about your new place of employment. Choose Change my Registration Info from the topic menu, and complete the other e-mail fields. If you no longer work for a Windows Mobile? Devices reselling business, you will be given ample opportunity to redeem your remaining point balance before your account is closed. [/quoPlease, please, please, be honest when you are filling out the company information at the beginning of this training program. If you don't work for a company please don't lie about it and tell them if you are a student or whatever. Just be honest. This is the only thing I have found that would suggest that you should work for a company to get these rewards. In any case, if you are honest, Microsoft can use their disgretion in deciding whether to send a reward to you or not because anyone that has a .Net Passport (ie. 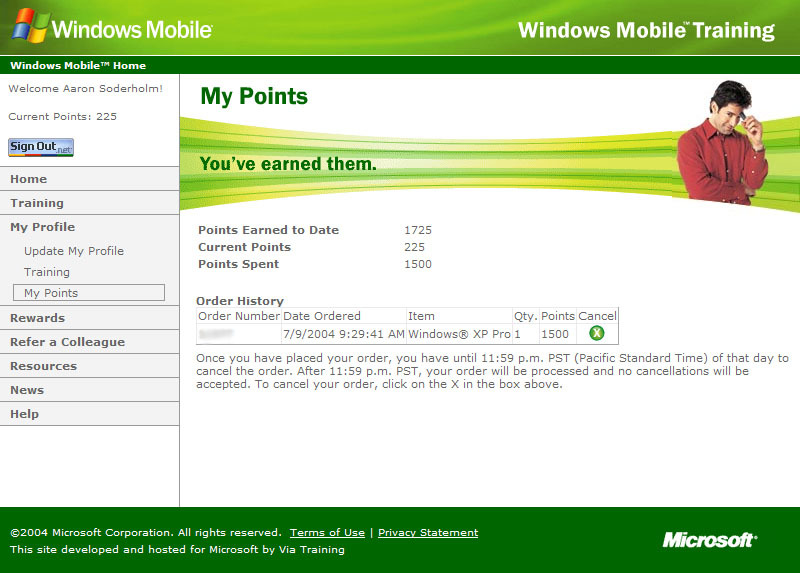 Hotmail or MSN email account) can login and gain rewards (that is the way I see it at least). Anyway, do this at your own risk.Mods, if you deem this in violation of Neowin rules, please delete. [/b] I already have my copy on the way! Thank you Microsoft! Is this limited to US only? or international? I'm not sure ... although, the order form looked US only. I did something like this a few days before XP went final. Sure enough, Microsoft sent me a retail XP disc. I had to score a certain ammount and say I worked at a specific place. I aced the questions and said I worked at Best Buy. The hardest part of the whole process was finding a store code the closest Best Buy to my house. sign up, enter your country and you should see a rewards section on the left menu..if not then you're out of luck. I think i've seen some UK people get it. I just made a store up (called it student), so hopefully, they will still send me a copy. Um ... the Club SI thread has all of the answers. 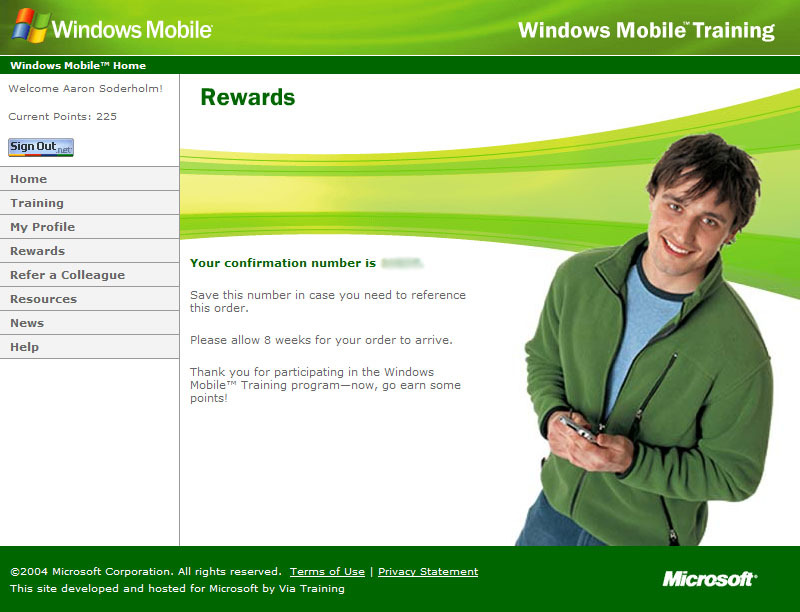 Note to mention: The reason I didn't link to the Windows Mobile Training Site is because you need to read the directions on the Club SI thread first! (ie. they tell you all of the answers and tell you what to do if you get stuck ). Just make one up or choose one from the list. I already did this on Wednesday...I'm getting the Keyboard and mouse combo! So, to all the people replying does this mean you don't have XP Pro legally? My father is still using Win 98 SE and I want to get this for him because he desperately needs XP! I do. E-bay off a copy. Make a hundred bucks for 20 minutes of my time? Sure! Where is the Mac shuffle? I tried this a few days ago, and Canadians can't get rewards at all. If any Australians are curious, sorry, I just tried, no free XP Pro for us. I updated the main page to reflect the fact that this doesn't apply to Canada or Austrailia. Thanks for the heads up.